Thread: which products for a 70s single stage paint? Brand new to The forum, but have been using meguiars products for years, mostly yellow wax number 26, show car glaze number 7, and the leather conditioners. I recently acquired a 1978 Toyota Land cruiser, with what looks like mostly original single stage paint. I've read a lot of product information, and a lot of threads on this forum, but I'm possibly more confused now than ever. I did a couple tests spots with the show car glaze number 7, which looks great! I was planning on following this with M's yellow wax #26. But again it seems now there's so many more products available. I've read enough to know, and agree with using the least abrasive product necessary. 5 then finally followed by a couple coats of M's yellow wax number 26? Or is there a better wax out now? I'm fairly good at using the 'search' button but if anyone has links to send me or any product advice it would be greatly appreciated! Re: which products for a 70s single stage paint? It's impossible to give you an accurate recipe without seeing the paint, but I've done a number of single-stage restorations and have some general guidelines. After a good cleaning and claying, apply a heavy coat of M07, applied by hand, using a folded terrycloth towel. Let it soak into the paint for as long as possible, preferably overnight if you can. It's not necessary to remove the M07 completely, as it will be a chore, but at least get enough off to be able to do a good inspection. I'll try a test spot with M205 (Ultimate Polish for an OTC alternative) and a polishing pad next, to see if satisfactory results can be obtained. If you find you need something more aggressive, you can always step up to Ultimate Compound, being very careful to identify areas such as body peaks where the paint may be thin. If you use UC, you may want to follow with UP to maximize gloss. Finally, another quick rub with M07 and you're ready for your final wax. M26 and Gold Class are excellent for gloss, just not as durable as the synthetic products. Mike Phillips, formerly a Meguiars trainer, has done some excellent articles on the same subject. Thanks for the great advice and links! I read one of his posts on the geek website and an additional link he had to a 70's volvo single stage resto. My avatar shows my vehicle now and I figured out how to attach it below. [IMG][/IMG] Your Toyota looks pretty darn good to start with! A bit of elbow grease should have it looking awful strong. I've been a huge fan of M07 since the mid 70's on my GM Single Stage lacquer vehicles. It's not nearly as effective on the later Basecoat/Clearcoat paints since their lower permeability doesn't allow the oil content of M07 to sink in and enrich the paint. Back in 2009, my employer severely downsized our management staff, costing me my job and my company cars. My garage queen El Camino, with original paint, got pressed into daily driver status through the spring rains and summer sun, causing both colors to fade and go dull, despite my waxing efforts. Machine polishing was all but fruitless, as the parched paint quickly absorbed any liquid content of the compounds causing severe dusting and a lot of caked-up residue on the pads. Later that year, searching for online help, I discovered this forum and eventually Mike's first article for Auto Trader Classics. Energized by my newly-acquired knowledge, I dug out my 30 year-old jug of M07 and went to work. Mike's article was truly a game-changer for me. 10 years later, the Camino is still in my garage, now coming out in nice weather only. I still repeat the M07 soak annually, just using much less aggressive polishes than I used originally. Despite being well past the normal lifespan of GM lacquer paint, my diligence has earned me a few trophies in judged shows over the years. Wow! 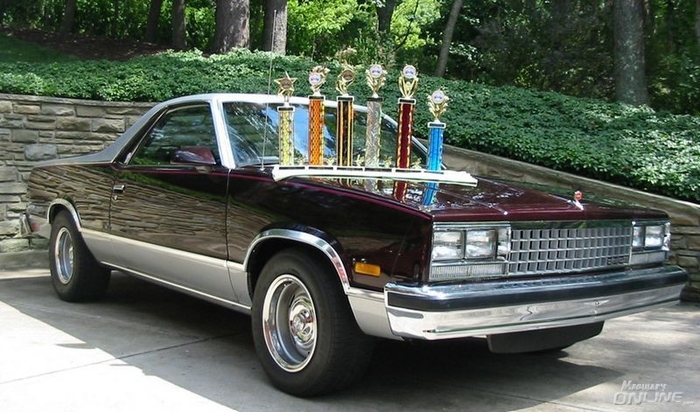 Your El Camino looks amazing! I will definitely read his articles, thanks for the links! Products for old cars with single stage paint ? Solid Single Stage Red - Best products to use with a DA (G110v2/G220v2) ?